Interspersed with my own blog posts, I will be running a new series on the ONE Christian book which has most influenced you. If you’d like to guest-post, email me at anitamathias1ATgmail.com. Thanks. Dan Schmidt opens the series, with a book whose central chapter I have read and posted on several times, and tried to “get.” “Getting it” even a little bit, as I have, is life-changing! A friend left a message on my cell phone to call, asking me to call, which I did. We talked via Skype: me in Florida, my friend in China. Such an occurrence hardly raises a pierced eyebrow these days—who can’t connect with someone half a world away in less time than it takes to brew a latté? And China—even that hardly registers. What once was on the earth’s far side is now less than a day away by air-conditioned , wi-fi enabled jet. As my friend and I were talking, I was thinking of another person who had moved to China for work, but whose experience was quite different. In 1854, James Hudson Taylor left medical school and booked passage on a steamer that would take him from England to Shanghai. That journey required more than five months. I think of Hudson Taylor often. His son’s account (Hudson Taylor’s Spiritual Secret) is one of the engrossing ‘missionary stories’ that started finding their way to my shelves during high school and college. Then, when I finished grad school and joined a church planting team, I scoured its pages for tips, but got more than I bargained for. My tradition—devout, sincere, and zealous about evangelism—had not prepared me for the sort of encounter with Spirit that Hudson Taylor had. Once he stumbled upon the ‘exchanged life’, Taylor had a new outlook on all he encountered. Reading about this was stirring as I faced challenges in the work to which God had called me. I wanted to find the peace and confidence Taylor recommended. Another of Taylor’s innovations was to adopt local customs. At the time, this was roundly criticized, and it cut Taylor off from much of the established ministry community. But some noticed that this young Brit had become extraordinarily effective in reaching Chinese people, and soon others were following his example. Taylor’s idea has since been taken up by people like Lesslie Newbingin, Shane Claiborne, and practitioners of ‘missional’ Christianity, who recognize effective kingdom ministry calls for the study of and even being shaped by one’s culture. But to focus on methods would be to miss the man’s particular madness, for Hudson Taylor discovered that for all his industry and willingness to embrace change, he was lacking a heart full of God. This nearly drove him to distraction, but once he stumbled upon a simple, elegant ‘secret’, he could hardly speak of anything else. Fixated as he was on “not striving after faith, but resting on the faithful One,” Taylor would talk and write to those around him about giving all over to God in absolute trust. He found his credo in the hymn Jesus I am resting, resting …, which he would sing while walking the streets or pacing rooms where he stayed. Taylor faced difficulties: he buried young children, lived on the thin edge of poverty, attracted public ridicule, weathered storms, bandits, and political upheavals. He also never tired from pushing forward, into China’s interior and around Europe and the US, urging people to care for the millions who lived outside the news of God’s love. His work was supported by George Mueller, Andrew Bonar, Charles Spurgeon, D. L. Moody, and many others, less well-known, but drawn along by the passion they witnessed. Hudson Taylor counted on women to open fields for missionary service, and gave away most of his personal funds. He urged people to spend their lives on China, and made no promises for their care other than to point them to a loving Father who would never forget them. 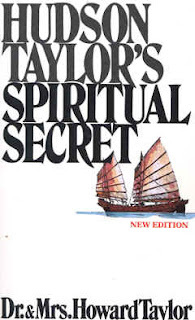 After a convalescence in Switzerland necessitated by chronic poor health, he returned to China when he was 73; Taylor died there days before he was scheduled to preach in Hunan province. The mission to which he gave his life resulted in an agency—now known as Overseas Mission Fellowship—that is nearly 150 years old. The former physician’s assistant who insisted that “God’s work, done in God’s way, will never lack God’s supplies,” also said that “I never made a sacrifice”—and by recording both lines for us, this book officially qualifies as dangerous. I read it when I want or need to be reminded that when “God calls a person, He bids him come and die”—to quote Jim Elliot, another missionary who was similarly intense, extreme, committed, and effective. I also find in Hudson Taylor’s Spiritual Secret that apart from the thrilling adventure of opening a ‘foreign’ country to the Gospel, Taylor’s story revolves around the deep yearning for a life full of Spirit—and that’s where I want to go. Dan Schmidt has pastored churches, eaten wot on injera in Ethiopia, and fished for sharks. He was raised among expatriates, and has lived in Latin American and central Pennsylvania with his family. Dan is the author of three books of devotional exegesis and two novels; he blogs at www.toucanic.net.